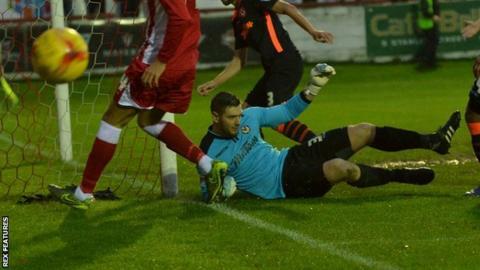 Accrington's game against Newport County should have been called off at half-time, says Stanley manager John Coleman. Heavy downpours before and during the game at the Wham Stadium caused the ball to hold up in certain areas. Stanley twice came from behind in the match as Matt Crooks tapped in his seventh goal of the season late on in the 2-2 draw. "It was difficult for both sides," Coleman, 53, told BBC Radio Lancashire. "The ref should be congratulated for getting the game finished but it became a lottery and I think it should have been called off at half-time," he added. The result leaves the Lancashire side sitting fifth in League Two, two points off the promotion places, and Coleman believed that the game might have been called off if Newport counterpart John Sheridan had agreed with him. "I think if their manager would have wanted the game called off then it would have got called off at half-time as I think the referee was leaning towards what I was saying," he added. "I can understand their point of view that they've travelled a long way and at half-time they have a clean sheet and they don't want to come back here on a Tuesday. "I can appreciate all of that but it wasn't conducive to be able to play proper football because you couldn't run with the ball and I think that as hampered us more than them."